You can’t imagine my delight when I found out about this word, ‘farali’. It means ‘fasting’ and in our unique Indian way, fasting also has an awesome spread of dishes. I had always heard of ‘vrat’ or ‘upvas’ for fasting menu but never ‘farali’. Guess, that is why we do a mega marathon to find such deeper meanings in life. So suddenly my options for the alphabet F grew by leaps and bounds and I was actually spoilt for choice. Who would have thought? Another interesting option I came across was ‘French Fries Dosa’ which is a popular dish in the Mumbai street food world. I was very tempted to do it but I was dissuaded by the fact that it involves too much deep frying and my Tamizh heart did not allow me to try combining dosai with french fries. So here we are with Farali dosa. As you said, Farali is the key word for the day. This version of dosa sounds yumm, Sowmya. Today there are so many farali recipes and even I learnt about the word today. This is why we take part in BM. The dosas look so good and perfect for fasting. I would really like to know more about the french fries dosa. Wonder how french fries dosas will be, have to check for it. Farali dosa looks excellent and just prefect for fasting. Healthy and nutritious. 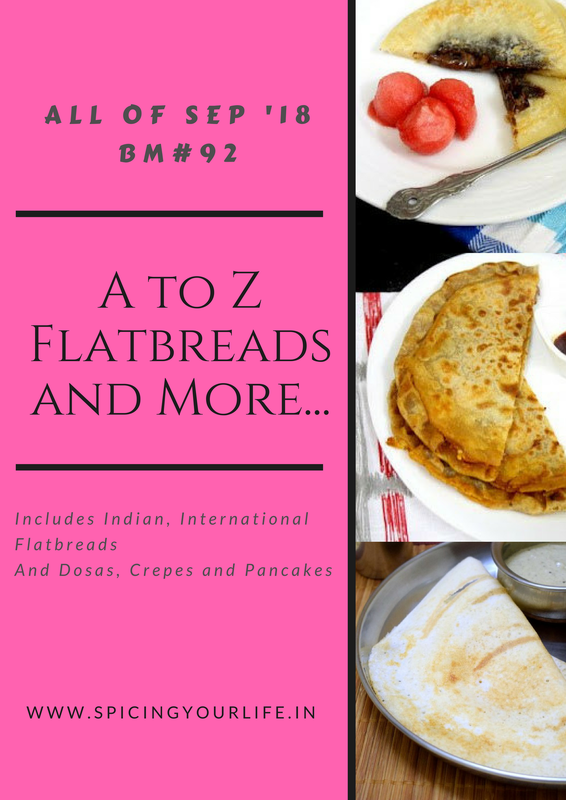 I’m going to put on kilos this navratri….so many farali dishes are there today for letter F. This farali dosa is going to be one of the dishes I’ll make during navratri. farali dosa looking awesome Sowmya. Soft and perfectly cooked dosa surely a great pick in navratri fasting. it is more feasting with it. hahahaha I agree on the Mega BM giving us life lessons, I learned about farali couple of years back when I made a farali sweet…lol..these dosas look and sound fantastic..btw those french fries dosas sounds so yummy yaar, guess the Mumbaikars can think of anything with dosas.. I guess after the flatbread mega marathon it is time for all us to go on fasting and these recipes will come in handy for that day. I love this dosai, but I still can’t get over the French Fries dosai. I have to go and look into them now.